Set up a link page. Tweaked several sections of the site to simplify their presentation. Unveiled the site for public viewing. I just wanted to thank everyone who's come to the site thus far. I never would have expected a thousand people to visit the site in such a short amount of time. In thanks, I'm working on formatting the Training Camp short story; it should with luck be up later this evening. People might have noticed a few minor changes here and there, as I've been modifying some of the site's pages. Most of these are very minor bug fixes, but the links page has been changed slightly to better represent the artists who originally drew the various pictures for Mashiro Yuu. If you like what you see here, please go to the forums and put a thank-you note for ELIZA. She helped me a lot in getting this site set up, as well as communicating with Mashiro-san to make sure everything was set up a way in which he approved. Given the sheer number of hits over the first day this site has been live, I decided to go ahead and just do the whole update that I was preparing for this weekend early. Okashina Futari #111-120 and Training Camp are now up. In addition, there is now a Short Stories section for stories like Training Camp that have no external continuity. A new Okashina Futari flash animation has been made. It's a collaboration between Mashiro Yuu-san, the author and creator of Okashina Futari, and Ohyuki-san, the talented artist responsible for most of the Okashina Futari artwork, as well as the "Bride in a Wedding Dress Transformation" flash animation. Watch it. It's good. I won't say any more because I don't want to spoil it. If you liked it, please consider going to the forums (the link on the navigation sidebar to the left) to express your appreciation. ELIZA regularly checks that forum, and that way she can pass things on to Mashiro-san. Okashina Futari #121-130 has been uploaded. In addition, I received the missing flash animation for Training Camp from Mashiro-san. Finally, there have been several more pictures uploaded to the site: A 300,000 hits commemoration done for "Ichigo-chan the Mother" (Hunters series), another 300,000 hits commemoration done for "Present from the Sky?" (Hunters series), a before/after picture done of Ichigo, Hunter #1 (Hunters series), and lastly another picture from the TS game. Enjoy, and as always, feel free to leave comments on the forums. Okashina Futari #131-140 and Okashina Futari #141-150 have both been uploaded. I was rather busy this week with work, so I didn't have much time to work on formatting stuff. So I decided to work a bit harder today in order to get the next two sets of Okashina Futari chapters done. Please note that at this point, the translations will be jumping around somewhat, so there will be a number of chapters which are by themselves. There are also about 20 chapters where the Japanese chapters currently end that have been translated and will be uploaded in due course. I just wanted to say thanks on behalf of myself, ELIZA, and Mashiro-san, for all the people who have come to visit Mashiro's Castle in the Internet since it started on May 27, 2010. Hopefully, we'll get to 100,000 hits before too long. In any case, see you then! This story has 27 individual pictures commissioned for it by Mashiro-san, which are also available in the main gallery, and as a gallery of their own. Incidentally, please check this topic on the forums if you want to see the latest project I've been working on. It has nothing to do with this site, but fans of this site might enjoy it. Remember that new Flash animation done by Ohyuki and Mashiro a few weeks back? Well, here it is. Sorry for the lack of translation of the speech bubbles; ELIZA and I haven't had time to work on that, so it'll go up in a future update. Also, there have been two pictures uploaded to the site, which weren't actually on the old English site to my knowledge. Both of them are actually picture sequences which cover a section of the Okashina Futari chapters: The Wedding Dress Saga, from approximately chapter 70 to chapter 130, and The Chinese Dress Saga, from around chapter 300. Both pictures were made by Yozora, who has also done pictures for Angel or Devil, still up on the old site, as well as a few for Kayo-chan stories. Just one item this week. A book review called The Great King of Terror, written by Tsutomu Asibe of the Yhu Publishing Company. What does this have to do with Mashiro-san's works? Read and find out. Two pictures were uploaded this week (First and Second), both from Angel or Devil. The story itself will be re-edited and uploaded at a later date, after all of the pictures from that story are uploaded. I also translated the two pictures (First and Second) from the TS game which had previously been uploaded with Japanese text. I did not have assistance from ELIZA or another Japanese translator for these, so please bear that in mind. Just one picture uploaded this week, Model, from the Akira-kun series). However, I made sure to translate the accompanying text that went with the picture. Translation can be difficult work, but it's worth doing. Just one picture uploaded this week, a picture of Ichigo-chan, from "Ichigo-chan's Birth" in the Hunters series). Unfortunately, this one was beyond my ability to translate, so rather than putting up a half-hearted one, I left the Japanese text in place. I'll ask ELIZA for help at the first real opportunity. Also, there's some real news this week. Due to time constraints - my real job is in an IT department in a college, and the fall semester starts in August - I will have to go to once a month updates, at the end of the month (meaning the next update will be at the end of August). However, this will give me more time to actually work on the updates, so there's more likely to be stories posted (such as the sequel to BUG or some of the other translated short stories), instead of just a picture or two a week. It'll also give me more time to work on translating stories and such. Here's the things that have been uploaded this month: BUGS, the second story in the saga of the ship who's systems were sabotaged by a hacker with salacious secret interests; the 21 pictures which accompany BUGS (available in the BUG image gallery); Okashina Futari chapters 151-154 (as yet, those are the last sequential chapters that have as yet been translated, although a number of non-sequential chapters have been translated in the interim); a picture from the Kayo-chan story "The Longest Day of a Certain Riot Squad"; and another Okashina Futari picture sequence drawn by Yozora, this one involving a scene where Ayumi goes with his sister as a girl to a karaoke box (approximately #171 to #194). Finally, I have also uploaded the three new pictures drawn by Ohyuki for Okashina Futari. I originally wasn't planning on adding these with this update, since I wasn't sure specifically which chapter they were associated with; however, after some thought, I decided that that was not a good reason to leave them out. Please bear in mind that they are not yet translated, though with luck that should change by next month's update. And I have to say, over 31,000 hits in the space of three months is really something. That averages about 10,000 hits per month; if things continue at this rate, that means this site will have 100,000 visitors by March next year. I wonder if it'll hit sooner than that? Enjoy, and as always, feel free to leave comments on the forums. The next update will be September 25-26. Here's the things that have been uploaded this month: A number of later chapters from Okashina Futari. Specifically Chapter 1530, 1534, 1535, 1540, 1541-1550, 1551-1559, 1562, 1563, and 1565. With luck, when Mashiro-san continues the series, this will allow ELIZA and I to start translating from there. I'm sorry for the fact that there's so many breaks, but those chapters haven't yet been translated. When they are, they'll be uploaded. Also, luckily, Mashiro-san had gotten another Okashina Futari picture drawn by Ohyuki. I'm not entirely sure who the woman in the picture is, but I believe she is the same character shown in the most recent picture, with Ayumi in a blue dress. Finally, I edited another of the short stories that were on the old English website. This one's called Taro Urashima: The True Story. The story as it's traditionally told is about a fisherman called Taro Urashima, who was whisked away to a palace under the sea after rescuing a giant turtle from some children who were tormenting it. Although he only stayed a few days, when he returned, 300 years had passed. This short story takes up at this point. Enjoy, and as always, feel free to leave comments on the forums. The next update will be October 29-30. First, I didn't note it at the time, but Mashiro's Castle in the Internet has now exceeded 50,000 hits. That's roughly 10,000 a month, which is pretty impressive. Also, Mashiro-san has gotten yet another Okashina Futari picture drawn by Ohyuki. While I don't know the specific details, it comes just before the previous picture. I apologize for the lack of other content this month; I have been kept rather busy at work and I have little enough time to translate and upload stuff. Plus I've been feeling a bit under the weather, what with fall weather changes here in the South Midwest United States. Enjoy, and as always, feel free to leave comments on the forums. The next update will be the last weekend in November. Sorry for the slightly delayed update. I usually intend to have something up by Sunday, but I was distracted with real life concerns (among other things, I am preparing to take the JLPT N5 exam this coming Sunday), and only realized that I had not put an update up today. Somehow, the hit counter got reset. I don't know how. Given the number of hits that I can confirm, I reset it to 60,000 + the number of hits that were actually listed on the counter. Here is another of Mashiro-san's short stories, It's Breeding, a "game review" in the same vein of "The Great King of Terror". Enjoy, and as always, feel free to leave comments on the forums. The next update will be the last weekend in December, as usual. Again, sorry for the delayed update. I was preoccupied by other things due to the fact that I had a large amount of time off for the holidays, and I didn't think seriously about the upload until the New Year had already passed. Something weird is happening with the hit counter; it was reset sometime between the last update and when I checked it just now. As a result, I will be checking it more frequently to try to catch whatever's causing the problem. In the meantime, it's being reset to 70K + the actual listed value. I will also be checking it more frequently to determine when this is happening. Anyway, here's this month's uploads: A number of chapters from Okashina Futari. Specifically: 1532-1533, and 1564. Also, starting with 945, as it begins a new arc; I am assisting ELIZA more directly with the translations for this set. Again, a little late. I was sidetracked by the big storm that hit America these past couple of days. No excuse, because I more or less had the update ready to go up on the 31st. The counter appears to have not reset itself this month. So with luck whatever was causing it is fixed. Also, almost 92,000 hits; given that this site only went live last May, that's fairly impressive. Anyway, this month comes more Okashina Futari uploads: 1124, 1125, 1130, and 1131, 1134, and 1138. There hasn't been much done on the few remaining chapters for 1521 up, so I decided to upload another section which is at least partially completed. Enjoy, and as always, feel free to leave comments on the forums. The next update will be by the end of February. The kana in the title is how you write "Happy Valentine's Day" in Japanese. In Japan, the holiday is celebrated a little differently than in America; girls give chocolate to boys they like, or to male friends as a courtesy or social obligation. A month later, on White Day (ホワイトデー), boys are expected to return the favor with (generally) more expensive gifts. So if any of you have seen a big production made out of a girl giving chocolates to a boy in a manga or anime, that's probably why. There are two new Okashina Futari pictures by the talented Ohyuki in the gallery, one of the artist dressed rather stylishly at a Japanese cafe (yes, the shirt is a plug to one of Mashiro-san's other series, Kayo-chan Hunters, since the name of Hunter #1 is Ichigo, translated as Strawberry), and the other a short precursor to the existing one where Ayumi is made to wear a Chinese dress. The latter picture is especially well done, and the expressions on the characters' faces help make it work. Second, I edited another of Mashiro-san's stories, The Knight-killer. What happens when a common, low-ranked man in a kingdom discovers he has a very special talent? Bad news for those on top...read to find out more. Enjoy, and as always, feel free to leave comments on the forums. The next update will be by the end of March. There is a new page in the Okashina Futari section, of the 10th Anniversary Special. Drawn by Ohyuki, these four-koma comics depict the wacky hijinks that ensue after Satori receives an invitation to a party...to say any more would be telling. The two pictures are also up in the main gallery; please note that they're presented in Japanese format, so read the right half of each comic first to get a proper understanding of what's going on. Enjoy, and as always, feel free to leave comments on the forums. The next update will be by the end of April. A day late, but it's here. I aplogize for the delay; I had to create a new section for it, and it involved some intricate modification of the existing php code. The new section is Okashina Futari Lite. It is a summary of each ten-set (and sometimes more than one gets summed up at once) of Okashina Futari chapters. So far, the first ten summaries (Chapter 1 to Chapter 100) are up, and more will come next month. With luck, we will be able to have at least a general summary of the entire story before long, which will help people who might be feeling lost at the way the translated chapters tend to jump around. In addition, another new piece of artwork from the talented Ohyuki. In case people are wondering, the girl with long black hair sitting with Satori is Kyouko Nagasawa, a childhood friend of Ayumi and Satori. That should explain the picture a bit better. Enjoy, and as always, feel free to leave comments on the forums. The next update will be by the end of May. Well, it's been a year since I unveiled this version of the website. And in that time, it's averaged over 11,000 hits per month. Thank you to everyone who visits and who comments on the forums. Because of that, I did a little extra work for this month's update. I have the next ten summaries (Chapter 101 to Chapter 200) of Okashina Futari Lite up on the website. However, the Okashina Futari Lite summaries currently only go up to Chapter 240. If anyone would like to see more of these summaries, please post on the forums. If enough people ask for additional 10-chapter summaries, Mashiro-san might be able to find the time to write more of them. There were also two more pictures drawn by Ohyuki. The first is a follow-up to last month's picture (and to the one where Ayumi is wearing a bikini). I won't spoil the surprise, but Ayumi is apparently quite annoyed at Satori. The second comes from later in the series. Based on what I've been able to read, apparently Ayumi's undergoing several involuntary costume changes, and the restroom was the only private place available. Speaking of pictures, I replaced the text for several translations of Okashina Futari pictures in the gallery. Instead of being in Japanese, those pictures all have English captions now. Okashina Futari #156, the next in line from the beginning, has been posted. In addition, #1526-1529 and #1536-1537 have also been posted. Only #1531 is left to translate of that bunch (#1521-#1565) is left to translate. This is not so much an update as a correction. I had a clerical error regarding #1531 and hadn't recorded it in my notes. ELIZA reminded me of where it was, so it's now up. As of now, all the chapters from #1521 to #1565 have been translated and posted. First up, let me apologize for the delay. I had to take care of several things at the beginning of the month, and given that it was a fairly substantial update (a story and the nineteen pictures that go along with it, plus some tweaks to the BUG story pages so they'd display in the proper order, then the tweaks to the BUG picture pages so that they would still link to the right story)...well, you see what I mean, I hope. Anyway, I finished uploading BUG3 and its associated pictures. The hapless starship and its crew continues to struggle with the bugged-up TS system, and now they have a new problem too...will they ever get out of this mess that they're in? Somehow I doubt it...at least not without a few more costume changes in the process. There's also a bonus this month. ELIZA made a before/after line-art picture, and she wants readers of the site to color it (captions are also okay) in order to express their gratitude to Mashiro-san. Pictures that meet a minimum level of quality will be sent on to him as they're submitted. Please submit all pictures to castle DOT in DOT internet AT gmail DOT com (obfuscating to keep from getting spam), or on the forums. Enjoy, and as always, feel free to leave comments on the forums. The next update will be by the end of July. No, I didn't skip a month. It makes more sense to me to call an update based on the upcoming month, rather than the month that has just passed. Also, as a note, the counter got screwed up again, so I reconstructed it. I've also made some changes to the counter code that I hope will help keep this from happening in the future. Anyway, back to Okashina Futari this month. Chapters #157, 158, 160, 170, 171, 174, 176, and 180 are now uploaded. These chapters conclude the wedding dress arc, cover the introduction of Kyouko Nagasawa into Ayumi's class, and begin the karaoke arc of the story. There are also three new pictures and one that got missed previously. One of the new ones is a reprise of the famous wedding dress, and one of the others...well, let's just say that it's a little risque and leave it at that. In addition, seven of the last eight pictures have been appended with English text rather than the original Japanese. Enjoy! I am leaving the picture that ELIZA drew (a before/after line-art picture), to allow people to submit their own take on it.. Entries will be forwarded to Mashiro-san. Please note that modifications to the picture are acceptable, such as to add captions or to allow for creative license. Please submit any renditions pictures to castle.in.internet @ gmail.com (obfuscating slightly to keep from getting spam), or on the forums. Oh, yes, before I forget, please note that some of Mashiro-san's stories were done as commissions by him for other people. Please check with myself or ELIZA before translating them, to ensure that nobody's toes get stepped on. Enjoy, and as always, feel free to leave comments on the forums. The next update will be by the end of August. Between the end of the month falling in the middle of the week, and how busy I've been with work and other things, I had to delay the monthly upload somewhat. I will have something posted by tomorrow evening. Again, apologies for the delay in the update. I am modifying the format of the update post to simplify it and hopefully make it easier to use. Okashina Futari: Chapters #381, 382, and 387. Gallery: Two pictures from the Hunter story "Ichigo-chan's Birth!" (1, 2), a picture from the TS Game, a picture from the "Angel or Devil" story, and a picture from the Kayo-chan story "Day of the Children". Credit goes to Saibashi for the TS Game picture, and to Yozora for the others. There were also some minor updates to several other gallery pages regarding the text. Other News: I am looking into updating the site, specifically to provide different forums than the ones currently being used. I will provide more information on this once it is available. Enjoy, and as always, feel free to leave comments on the forums. The next update will be around September 30. Apologies for the delay. I have not been feeling well for the past week, and also had to deal with real-life stuff that interfered with getting the update ready. 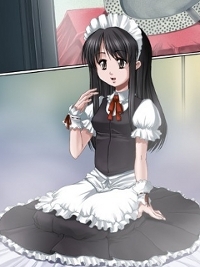 Gallery: There's a new Okashina Futari art sequence up, consisting of fifteen pictures that cover Ayumi's very first transformation in the story. The pictures start from here. In addition, there are two additional pictures that give some short details on Satori's and Ayumi's transformative powers. Other News: There are some new rules posted on the main page for those who wish to translate Mashiro-san's works (or have the translated by someone). Enjoy, and as always, feel free to leave comments on the forums. The next update will be around October 31. Apologies again for the lateness. In order to break myself out of the rut of updating late, I'm going to work on having an update ready by the 27th. Original Works: Chapters 1502, 1503, 1510, 1511, 1513, 1516, 1519, and 1520 of Okashina Futari. Gallery: There is only one new picture, but it is an original picture, done as a thank-you for making this site and keeping it going for over a year. This update has actualy been ready for more than a week, but I was delayed in putting it up. Apologies for that. Original Works: Chapters 159, 161, 1501, 1507, 1508, 1509, 1515, and 1517 of Okashina Futari. First off, I think I've finally caught the bug that was resetting the counter. Also, this update is particularly late, and I'm sorry for that. However, given the latest Okashina Futari picture sequence, I'd say it was worth the wait. Original Works: Chapters 1491-1493, 1497-1500, 1504-1506, 1512, 1514, and 1518 of Okashina Futari. That competes the latter two sets. Gallery: The text for the picture of Ayumi in a Samba dancer costume has been translated. In addition, two more pictures have been uploaded, one from the Kayo-chan series, and one from the Nanashi series. Also, a new picture transformation sequence for Okashina Futari has been uploaded (only the starting image is being linked here). It's hard to imagine that the two-year anniversary of Mashiro's Castle in the Internet is coming up in May. Those of you who've been watching since last year may remember this saying: ハッピバレンタインデイ！ In other words, "Happy Valentine's Day". In Japan, girls (and women) traditionally give chocolate (チョコ) to boys (and men) today. If it is because of a romantic attachment, it is 本命チョコ ("true feeling chocolate"), which is either homemade or expensive; chocolate given to a coworker or casual acquaintence is known as 義理チョコ ("obligation chocolate") and is usually lower-quality. Boys (and men) generally reciprocate with more expensive gifts on March 14, known as ホワイトデー, White Day. This will be a small update. I had to do a large amount of fairly small changes to a large number of pages, because Ohyuki-san moved to a different website domain, and I had to change every single page that linked to his site. Also, it turns out that whatever is resetting the counter is still happening, so I will be tracking counter hits again. And I have been terribly busy since last month's update, so did not have much time to work on updates for this site. Gallery: Ohyuki-san drew a great illustration of Ayumi-as-bride and Satori-as-groom this month. I will be working on a larger update for next month, so please look forward to it. Please feel free to leave a comment on the forums, as well. It's a day early, but ハッピホワイトデー (Happy White Day). As I mentioned last month, tomorrow is the day in Japan when men reciprocate for the chocolate they received on Valentine's Day. Original Works: Chapters 1489, 1490, 1494, and 1496 of Okashina Futari. Gallery: I uploaded four pictures from the old site to the Gallery: Two Nanashi pictures, the final two that were commissioned for this series, a Kayo-chan picture commemmorating 300,000 hits (I was unable to find the actual story this came from), and a Hunter picture from the character gallery. Please feel free to leave a comment on the forums, as well. First off, I am very sorry for the delay in the update. I work at a local college, and April is one of the busiest times of the year since that is when students graduate. However, that's all done, and since I had the time, I decided to double-up on the update, so this will be for both April and May. Short Stories: I edited and uploaded the short story Body Exchange. All I'm going to say about it is that it doesn't involve an actual body swap. Gallery: I uploaded twenty-two pictures from the Hunter Series story Second Chance, illustrated by Kishiba Yuusuke. The first picture is here, and the rest can be scrolled through using the gallery navigation links. I also updated the links page with the website information for Kishiba-san. This also gets me more or less back on track with updating at the beginning of the month. This update will be quite small. I got sick last month for over a week, and I had to work during part of that time, so it delayed my recovery. I only got over it a bit more than a week ago, and I haven't felt up to doing much of an update. I'll see about getting something a little more substantial for July. Gallery: I uploaded a picture from the Kayo-chan story "Accident". I also updated the links page with the artist's information, though please note that they appear to have gone offline. Due to various complications, it has become difficult to keep up with a regular update schedule. So, instead, I will commence updating the site irregularly, when I have time. This will most likely consist of a single chapter of Okashina Futari or a single picture in the gallery. Original Works: Chapters 1472 and 1480 of Okashina Futari. For what it's worth, the main reason that I have little time to work on editing or updates is because my job has been keeping me very busy. However, I received a pay raise for my hard work there, so it's been paying off - literally. I am going to try to work on posting updates a little more frequently than once every six weeks, though. Original Works: Chapter 162 of Okashina Futari. I have been very busy with my job and other things in real life, but I haven't forgotten this site. So, here's an update. I also worked on the code for the counter and hopefully have finally nailed down why it has been sporadically resetting. Time will tell. Original Works: Chapter 299 of Okashina Futari. I'm not going to keep giving reasons for why I've been so busy (they haven't really changed, anyway). Instead, I'm simply going to apologize for it and resolve to update the site more frequently. I also discovered what was causing the counter code to reset and changed it to stop that from happening. 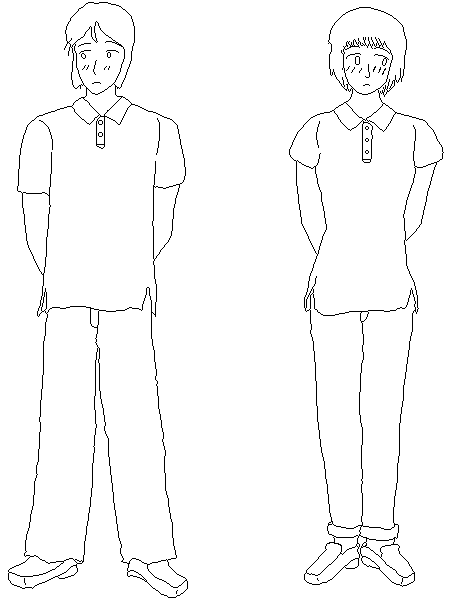 Flash Animations: The newest Okashina Futari flash. It's a prelude to the image with Ayumi and Satori both in pink and white waitress dresses. Please only send e-mails relating to the website, or if you want to get in touch with ELIZA or Mashiro-san. I will pass them on as needed. In addition, we are looking into getting a better messageboard. If anyone has any ideas regarding it, please send an e-mail detailing them. Please note, we have already considered PHPBB messageboards and the like.